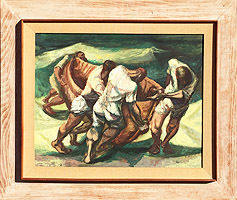 Francis De Erdely (Hungarian/American, 1904-1959) “Mexican Shark Fishermen” water color and Pencil on Paper within a pine frame and protective glass. Signed: ‘De Erdely’ (lower right). 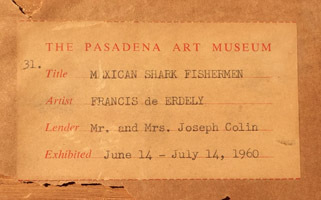 Bears a sticker on reverse from The Pasadena art museum, Title: Mexican Shark Fishermen / Artist: Francis De Erdely / Lender: Mr. and Mrs. Joseph Colin / Exhibited: June 14 – July 14, 1960. Circa: 1930. Provenance: A Private California collection. About Francis De Erdely: Theme - Style: Modernism, figurative art, still lifes, Abstraction. Media: Oils, watercolors, charcoal, graphite and pastel drawings. Artistic Focus: De Erdely’s works are considered a masterful extension of a humanistic tradition that has its roots in ancient Greece, Rome and the Italian Renaissance. 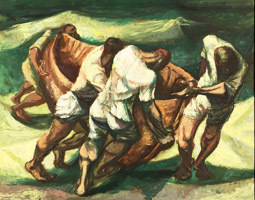 His early volumetric treatment of images gave way over the years, to a style that uses flat shapes and the angularity of Cubism to simplify its subject matter. Career Highlights: Born in Budapest, Hungary, Francis De Erdely studied art in his native city, as well as in Madrid and Paris, and began his career in Europe. But his depictions of the atrocities he witnessed there in the 1930s angered the Gestapo, forcing him to flee. After living for a time in New York and Detroit, de Erdely settled in Los Angeles around 1944. He continued to use his work to document the times in which he lived – creating respectful, yet mournful, images of blacks and Mexicans living in Los Angeles, and works that decried the impact of technology on man, the loss of democratic rights to Communism, and the ensnaring of individuals in a 9-to-5 routine. De Erdely taught art at the University of Southern California, the Pasadena Art Museum School and the Jepson Art Institute – and in doing so, strongly influenced a new generation of Southern California artists. 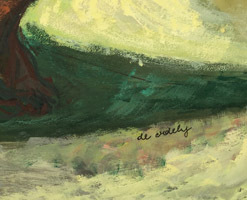 De Erdely's works are exhibited at: Norton Simon Museum, Pasadena, California. Laguna Art Museum, Laguna Beach, California. Frye Art Museum, Seattle, Washington. 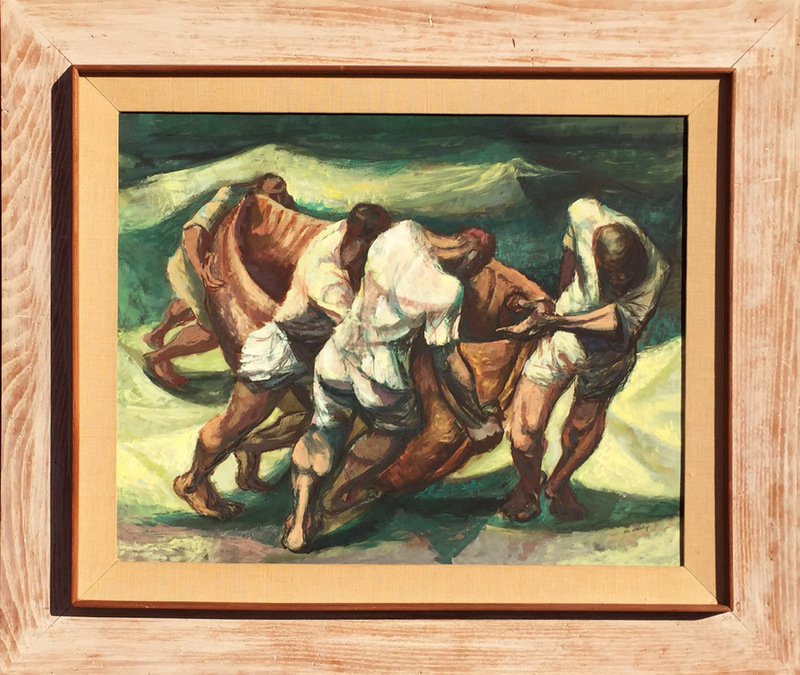 Francis De Erdely (Hungarian/American, 1904-1959) “Mexican Shark Fishermen” water color and Pencil on Paper within a pine frame and protective glass. Signed: ‘De Erdely’ (lower right). Bears a sticker on reverse from The Pasadena art museum, Title: Mexican Shark Fishermen / Artist: Francis De Erdely / Lender: Mr. and Mrs. Joseph Colin / Exhibited: June 14 – July 14, 1960. Circa: 1930. Provenance: A Private California collection. 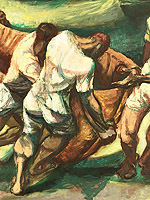 Theme/Style: Modernism, figurative art, still lifes, Abstraction. Media: Oils, watercolors, charcoal, graphite and pastel drawings. Artistic Focus: De Erdely’s works are considered a masterful extension of a humanistic tradition that has its roots in ancient Greece, Rome and the Italian Renaissance. His early volumetric treatment of images gave way over the years, to a style that uses flat shapes and the angularity of Cubism to simplify its subject matter. Born in Budapest, Hungary, Francis De Erdely studied art in his native city, as well as in Madrid and Paris, and began his career in Europe. But his depictions of the atrocities he witnessed there in the 1930s angered the Gestapo, forcing him to flee. After living for a time in New York and Detroit, de Erdely settled in Los Angeles around 1944. He continued to use his work to document the times in which he lived – creating respectful, yet mournful, images of blacks and Mexicans living in Los Angeles, and works that decried the impact of technology on man, the loss of democratic rights to Communism, and the ensnaring of individuals in a 9-to-5 routine. De Erdely taught art at the University of Southern California, the Pasadena Art Museum School and the Jepson Art Institute – and in doing so, strongly influenced a new generation of Southern California artists. Norton Simon Museum, Pasadena, California. Laguna Art Museum, Laguna Beach, California. Frye Art Museum, Seattle, Washington.